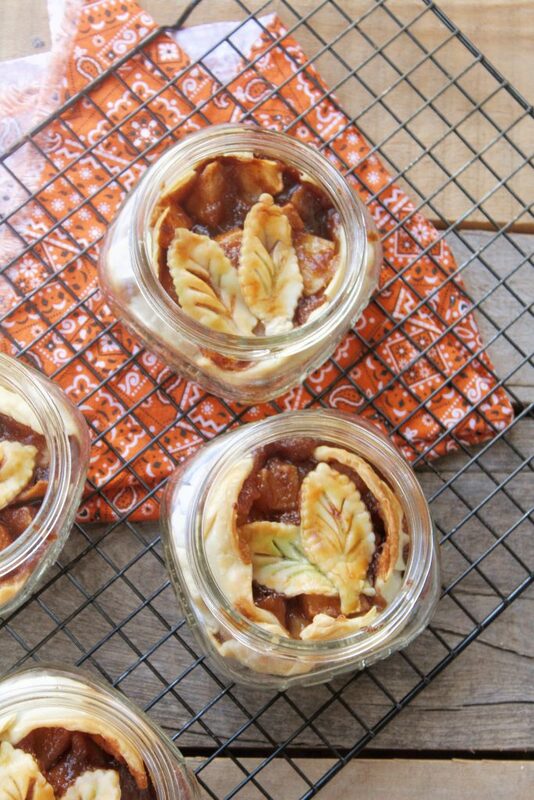 Mini Apple Pies with a caramel-esque filling baked in a mason jar. I can’t believe Thanksgiving is already this week. It seems like just yesterday it was the beginning of 2016 and I was wondering how I would make it until the holidays again. Because we all know the holidays are my favorite part of the year. Even more so than my birthday. So, let’s talk Thanksgiving. 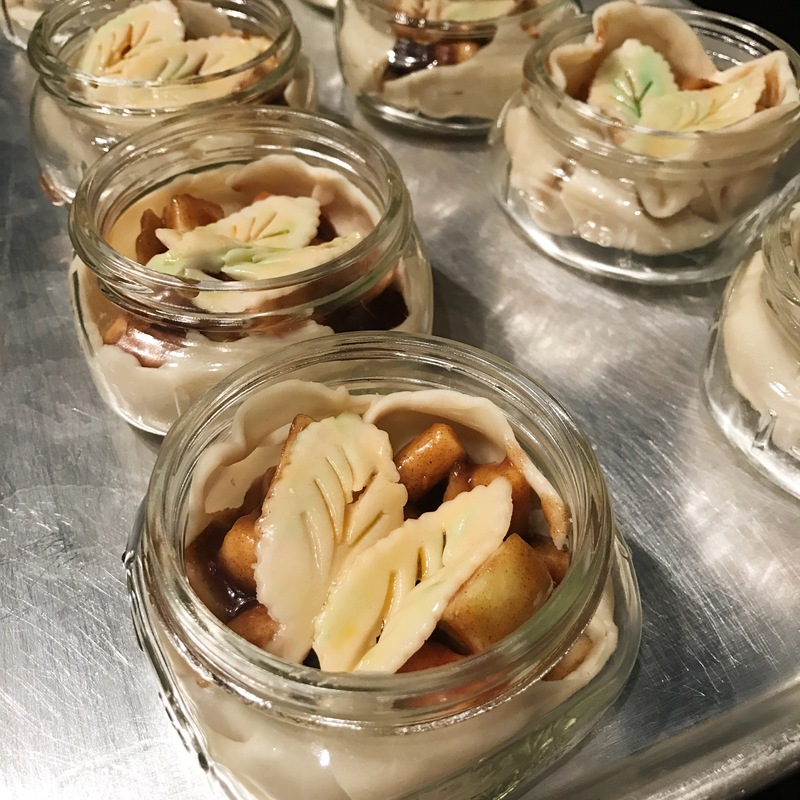 What desserts do you have around your Thanksgiving table? For years we had pumpkin pie, green salad and banana cream pie. All made by my mom. Now don’t get me wrong. Those desserts are plenty for me, but I do enjoy bringing something I made myself to the table too. Every year I seem to make something different. 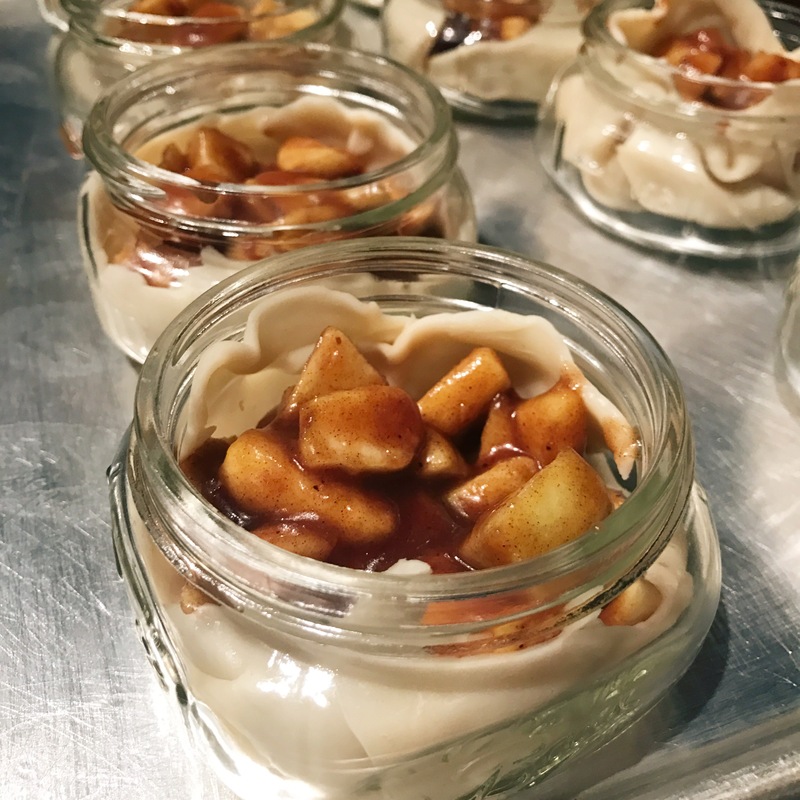 This year I’ll share these Pumpkin Pecan Pie Bites and this recipe for Mini Apple Pies with the family. Because you know I can’t resist a mason jar dessert. Like seriously, how can you resist food in a mason jar? It’s just so convenient and clever. And these jars also make a good hefty serving size. Perfect for Thanksgiving. 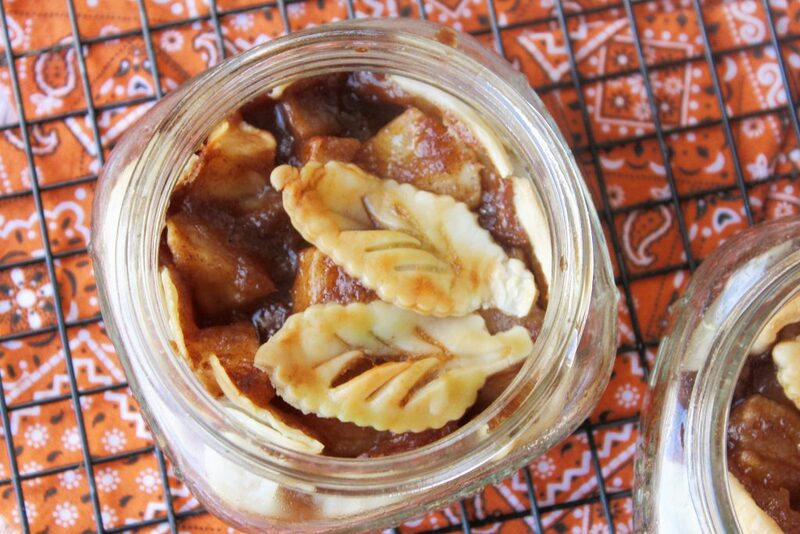 Mini Apple Pies drenched in a caramel-esque syrup are made into individual servings baked in a mason jar. Spray 8 mason jars with cooking spray. Roll out pie crusts and cut eight mini leaf patterns with cookie cutter per pie crust - I go right down the middle and then split the remaining dough into 4 equal parts. 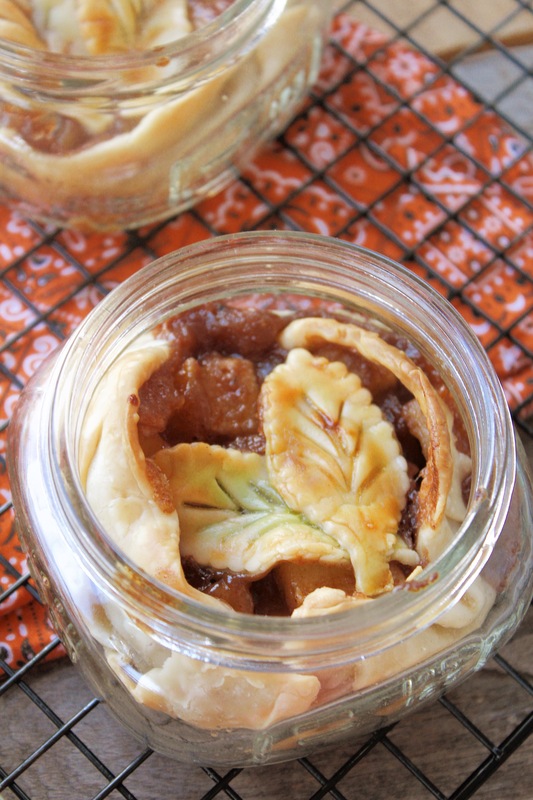 Take cut dough and fit into mason jars. Take diced apples and place in medium bowl. Add sugar, brown sugar, cinnamon, salt and nutmeg and mix together. Let sit while you prepare the syrup. In a medium saucepan, melt butter. Add flour and mix together to form a paste. Add water, sugar, brown sugar, and cinnamon. Whisk together and bring to a boil. Cook for 1-2 minutes. Take saucepan off the heat and add vanilla. Whisk to combine. Pour syrup over apples and mix together. Evenly distribute the apple mixture among the 8 mason jars. Optional: Evenly divide 1 egg white between two small bowls. Add orange gel to one and green gel to the other bowl. Mix with a fork or whisk to combine. Brush on leaf shaped cutouts. Or just brush on plain egg white. Gently place leaf cutouts on apples. 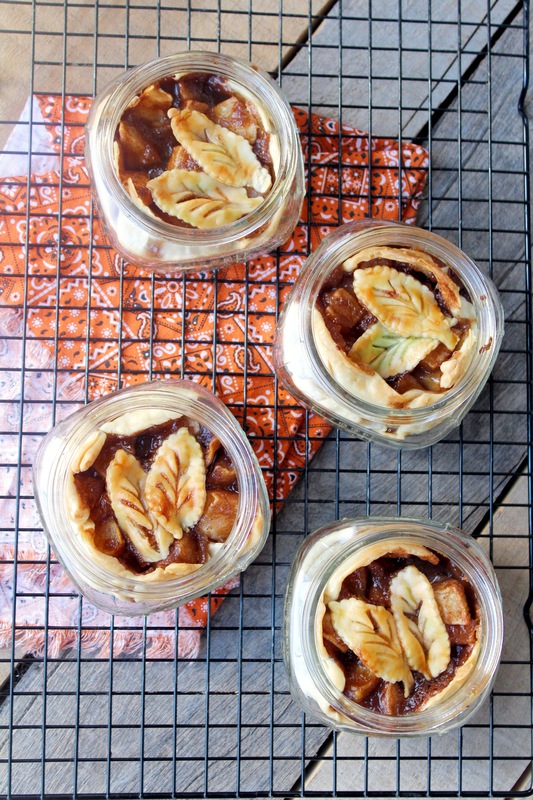 Place mason jars on a silpat covered baking sheet (to prevent moving around when putting in and taking out of the oven). Place in the oven and bake for 45 minutes or until pie dough is browned.